2014 Autumn Weekday cabin reservation discount special. Call 800-461-1023. When you choose our vacation rentals at Golden Bear Cottages "non hotel", you get more space for less money than hotels in the region. If you have difficulty making a reservation online, call us and you still get the lowest rate. You must ask for this special offer when making your lodging reservation with us. 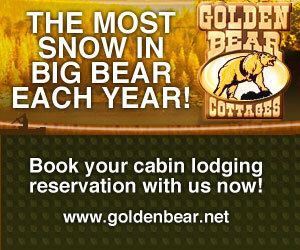 Ask about our year-round weekday vacation bargains on Big Bear group lodging too. All sizes of groups welcome. Limited number of pet friendly cabins with fenced yards where well behaved pets are welcome. Guests may receive FREE local restaurant and retail store coupons in addition to this special offer. Cash for lift ticket limited to maximum current value of a full day ticket at any one of the three local ski resorts( $59). Limited to one free offer per cabin rented. This offer is not available on holiday periods. Call us today for this weekday special. Discount vacation lodging offers can't be combined. This special weekday offer is only good for new weekday lodging reservations made from February 7 until the end of the 2013 snow season or until all availability is exhausted. This is a limited time weekday only offer. You may use the money from our exclusive Golden Bear Cottages offer to buy anything you want if you have already purchased your lift tickets or don't want to go skiing or snowboarding. $59 will be paid to guest at the time of check-in at Golden Bear Cottages Resort. Payment(s) to our guest will be made in the form of cash or check at the discretion of the Golden Bear Cottages management. Guest agrees to abide by terms of cabin reservation agreement. Most travelers look for bargains to go to far-away exotic places around the world. If they really do travel to those far away exotic places, they realize that the local residents in those "exotic places" are eager to travel to far away places too. Sometimes, that far-way place is in your backyard. What is exotic to one traveler may be common place to another. It is all in our attitude, or in the case of the Southern California mountains, our altitude. As families get larger and our expenses expand to huge proportions, many people decide that they just cannot afford any far away exotic vacations! Today, with airfare 30 to 40% higher, families are staying close to home. Big Bear Lake is offering "fantastic getaways in the pristine mountain ranges" right in the middle of our local mountains! Oh well, I thought, if there are people from far away places willing to travel to these mountain vacations in my backyard, let me try to get a nice deal and we'll go see for ourselves what all the fuss was about! Maybe there is something up there in the mountains that we didn't know about. It was wonderful, and the best part was that we accomplished it for less than 1/2 of the "fantastic bargain getaways" that the websites were offering! Now that's an amazing vacation! Our family and pet friendly cabin had a full kitchen with all the amenities we needed, so we did not have to eat out every day. That saved us over $100 per day. Our cabin also had a BBQ and outdoor private patio area where we had a daily cookout. This mountain resort had lots of free outdoor activities as well as a heated pool and spa and free family movies at the pool each night. The friendly people at Golden Bear Cottages also gave us discount coupons for 25% off boat rentals, stores and local family restaurants. The economy and budget crisis continue to make the headlines. The price of oil remains high and gas prices are punishing people at the pump. These are the tips we found that made our fantastic mountain vacation bargain right in our backyard for less than a tank of gas for the roundtrip. For those looking to make their summer vacation plans, many may be wondering, where are the cheap vacation packages? Big Bear is the place. When you choose our vacation rentals at Golden Bear Cottages "non hotel"... you get more space for less money than hotels in the region. families are staying close to home. mountain ranges" right in the middle of our local mountains! that we didn't know about. have to eat out every day. That saved us over $100 per day. off boat rentals, stores and local family restaurants. The economy and budget crisis continue to make the headlines. months. Now is generally the time to book your travel.